Adventure Companions: Mr MAP, Mini Monkey, the Giant Baby and a wonderful bunch of Hike it Baby families. Can we do something a little more, ahem, adventurous than Bold Park for Mothers Day? This was a request from another Hike it Baby mum. I had scheduled a whole bunch of hikes and once and totally missed the fact that it was Mothers day. Why was I not taking more advantage of this?! We thought about going to Paruna again. I love the place but I find it stressful to organise and host up there. We landed on John Forrest (Mr MAP’s suggestion) with the idea of splitting up into two groups if there were enough people. I named the groups the Eagle View Walkers and Gum Nut Gatherers with the idea that those who wanted to go at gumnut-gathering and picking-every-leaf-and-stone pace, could do so (with accompanying parent) and those of us who’s babies would nap at a faster pace, would do so on the Eagle View trail. I was very excited to see three other familes arrive, which meant my plan of two groups (and potential nap for the Giant Baby) would be actioned. Mr MAP lead the toddlers (and accompanying parents) off down to National Park falls and I lead the babies (and their Sherpas) off up the Wild Flower Loop. The last minute change of plan from the Eagle View Trail to the Loop was so that we could walk and chat at the same time. The Eagle View trail is mostly single track, where as the Wild Flower loop you could drive a car around. As predicted two out of three of the babies were able to get a nap (Giant Baby included). We chatted in the winter sunshine, fed the baby who refused to nap and strolled at a wonderfully consistent pace the toddlers would never let happen! 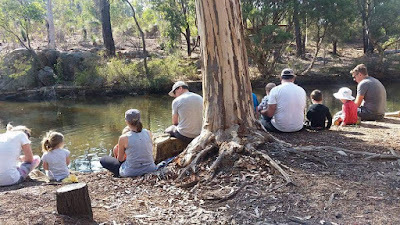 The toddlers toddled to the Falls, they found dinosaurs next to the trail on their return journey (hidden by Mr MAP on their way out there) and gathered pockets-full of nature’s gifts (gum nuts, sticks, stones, leaves etc). After our hike, we broke out the cakes which the hikers had brought/been promised and watched the ducks on the creek. I couldn’t have asked for a more soul filling day; celebrating it with friends I had made as a result of becoming a mother (and a member of Hike it Baby).